Blockchain use cases are making their way into the online casino business, most notably with cryptocurrency payments. The $50 billion entertainment behemoth that is online gambling has always been at the forefront of emerging technology. When internet access became widely accessible in the mid-to-late 1990s, online poker and other casino games popped up as some of the first interactive experiences. Today, online casinos offer fully immersive games like live dealer Texas Hold ‘Em that rival the experience of betting in a land-based casino. The revolution is already underway. The blockchain wins in the casino ecosystem where real money, reputation and trust are of paramount importance for both the operator and customer. Let’s explore the many ways in which it thrives in this industry. Currently, there’s an open frontier and lawlessness in the blockchain universe. Many experts liken the promise of this era to the internet’s nascent days, before Amazon, Facebook and Google were household names. While the companies that may become synonymous with a blockchain boom have yet to surface, there’s no question that the financial sector will be central to the action, with U.S. banks expected to spend more than $300 million on blockchain technology this year. The reason is simple: improvements in conducting financial transactions. The traditional systems of moving money often appear clunky, cumbersome and insecure when compared to blockchain’s capabilities. The distributed ledgers of the blockchain provide secure, fast payment settlements in a tamper-proof environment, providing for a more seamless transference of money for everything from funding your initial deposit in an online casino to betting on your favorite sports team. 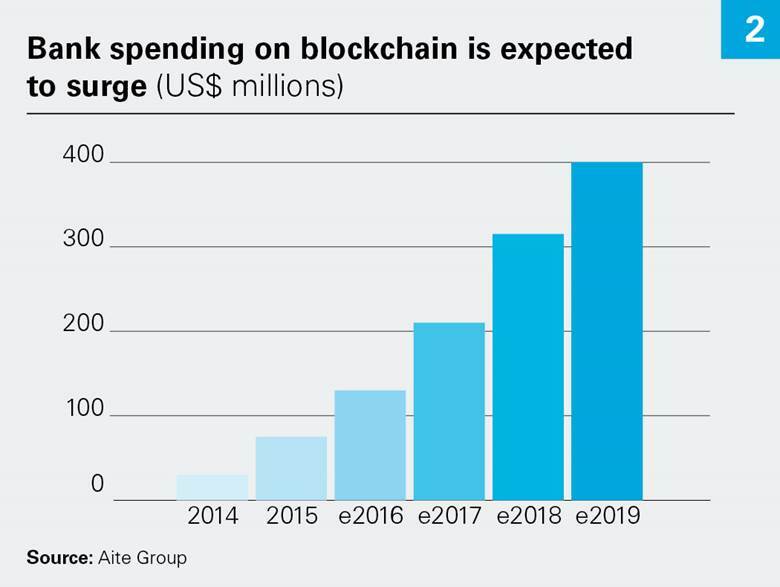 As U.S. banks ramp up spending on blockchain technology, implementations of the distributed ledger technology become more commonplace across industries. And financial transactions are the lifeblood of online gambling. The same frictionless money moving channels that banks leverage with the blockchain can be applied to online casino sites. The system seamlessly scales from a $20 payout to the winner of an Omaha Hi-Lo game to the bettor plunking down thousands of dollars in progressive slot play. The most visible use of blockchain technology in the gambling sphere is cryptocurrency payment acceptance, whether as Bitcoin or altcoins. Cryptocurrencies are increasingly welcomed by different platforms as the primary method for players to deposit funds or as an alternative to fiat currency and for good reason. Well established online casinos such as 888, however, are still wary of crypto and are waiting for the technology to mature before it’s introduced to the platform. Crypto transactions are anonymous, fast and efficient. These inherent characteristics of the blockchain are ideal for moving small or medium sums of money — the types of deposits common in online casinos. The transparency offered by the blockchain is another aspect that fits naturally for online gambling. When money is transferred, both the sending and receiving parties want assurance in the integrity of the transaction. 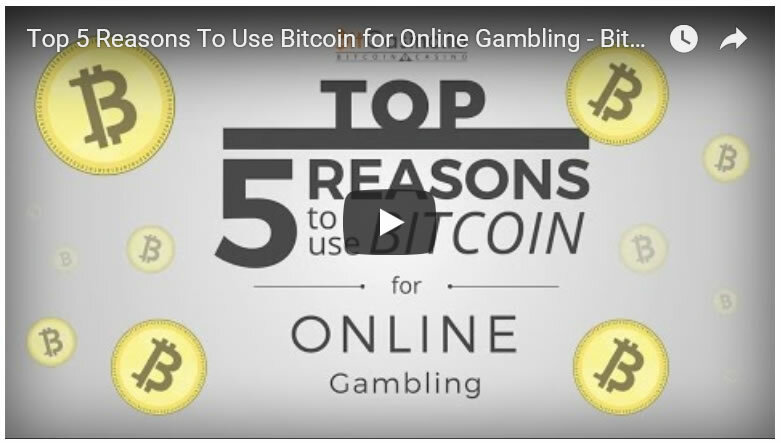 The advantages of using Bitcoin to fund online casino play. The blockchain’s reliance on smart contracts and cryptography guarantees that money transfers aren’t manipulated while providing proof that online gambling entities are who they claim to be. Nevertheless, there are some risks associated with cryptocurrency payments. Recent price volatility among crypto coins has caused some accepting merchants to take pause. In December 2017, the popular online video game service Steam announced it was no longer taking Bitcoin. Several publicized hacks of cryptocurrency exchanges have also spread unease. 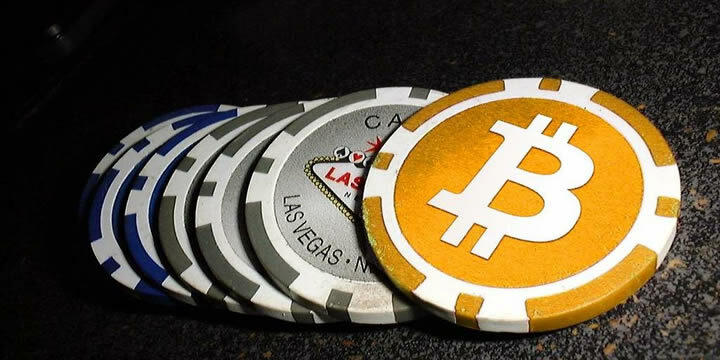 Going forward, industry leaders must carefully weigh the pros and cons of Bitcoin for casino and poker online. As we consider future ways in which the blockchain can benefit online gambling, the use cases will evolve from the intrinsic components of the blockchain, e.g., anonymity, immutable transparency, smart contracts and non-fiat value stores to platform design and infrastructure. For example, start-up company Virtue Poker promises a decentralized peer-to-peer (P2P) online poker platform built on the Ethereum blockchain. Instead of depositing money with a specific online casino, players fund games from their cryptocurrency digital wallets. Winning payouts are delivered back to the digital wallet. While in-game movements are executed using a traditional client-server model for speed, Virtue Poker relies on the blockchain to govern each hand by cryptographically signing and processing the resultant data. A full-scale online casino platform built on the Ethereum blockchain is the objective of the online game development community JoyToken. By creating a flexible back end protocol, JoyToken opens the door for third-party content creators to launch compatible online casino games with the transparency and security benefits of the blockchain baked in. Photo by iotcoresoft.com : P2P transactions facilitated by smart contracts represent a future model for online casino platforms. Currently, blockchain projects are also in development that leverage the “wisdom of the crowds,” a premise that states decisions made by groups of people based on information available to all members are better than decisions made by any single member of the group. Decentralized prediction markets surface within this framework that allows users to bet on the outcome of events. The data defining the bet upon an event and all transaction records of bets would is stored in the blockchain. While the model lends itself to traditional wagered outcomes like sporting events, it also opens the door for betting on unconventional markets from elections to the weather. The wisdom of the crowd’s application also informs itself by becoming iteratively smarter. As more bets are collected, so grows the data pile and depth of analysis. The predicted outcome of an event may become more accurate when more data points are in hand. Blockchain technology is poised to rapidly change the online casino industry, and cryptocurrency payments are only the first wave. In the future, we can expect more development of games and platforms that leverage the blockchain protocol. In the process, both players and online casino operators will benefit from increased transparency, trust and speedy payment settlements.